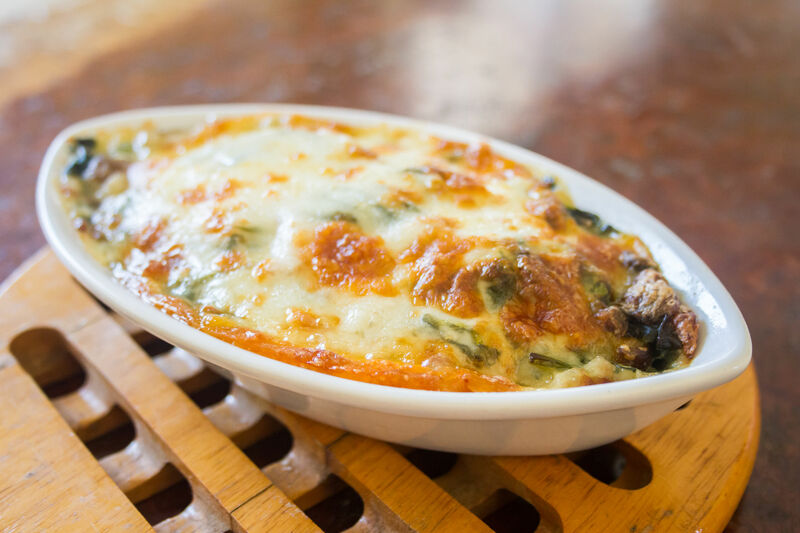 With This Baked Dish, Spinach Never Tasted So Good! Spinach is one of our favorite veggies, with or without other additions; it’s so good for you and it goes well with just about everything…we never get tired of it! Now, as you may have noticed, we also harbor pretty fond feelings for cheese – read: we’re obsessed with it always – so when we can dress a dish up a little with that melty goodness, we say why not?! Here, we’ve got a deliciously creamy and flavorful spinach base that we topped with not one, but two cheeses. We baked it to perfection and then stood back (after grabbing some for ourselves) and watched our family devour it. Now that’s the kind of dish we like! Place spinach in 2 layers of paper towels and squeeze out all excess moisture. In a large bowl, mix together spinach, mushroom soup, egg and Dijon mustard until combined, then season with garlic powder, salt and pepper. Pour spinach mixture into a large baking dish and top with cheddar cheese and gruyere. Place baking dish in oven and bake for 35-40 minutes, or until cheese is melted and bubbly. Note: cover with aluminum foil is cheese is melting too quickly.